Sample database design for User Interface Management system. 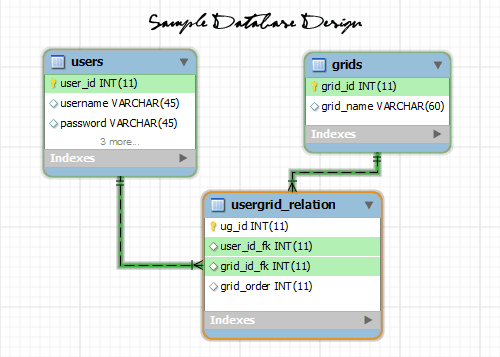 Contains there table users, grids and usergrid_relation. 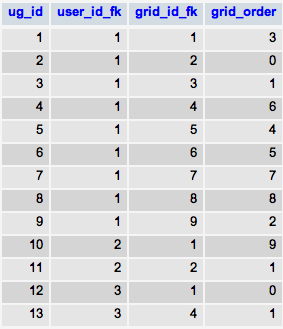 This table is relations between users and grids tables and grid order. Contains simple PHP code. Updating usergrid-relation table values where login user session id $user_session_id. Live demo is not working, please check. Um, no ie? Why not? I think its maybe better with the internal storage of the browser. "Demo - Don't try with Internet Explorer browser"
Why? IE8 - working good. @Srinivas Anyway, can we run this script with Internet Explorer? how to download full script........! Nice presentation. Good browser support. ie has a fixed value and I want to assign a dynamic value, that way I can do? 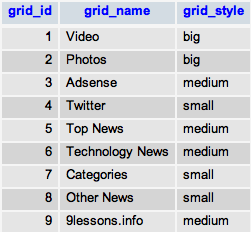 What use is the field grid_style of the grids table and how use it? I want to remove the button "Save Template" and changes make automatically. how make this? is this not working in IE ??? But it lag in Drop Event to go Perfect places.. can any one explain how Drop event take appropriate place to fit. Very nice grid, but it seems that it only works with jquery 1.4.2. If I use later jquery version thats needed for other plugin, the drag n drop function fails. Any idea why?